Presidential candidate Vladimir Zhirinovsky says two of his rivals, Mikhail Prokhorov and Sergey Mironov, plan to withdraw their candidacies days before the election, to ensure Vladimir Putin’s victory in the first round. “Prokhorov and Mironov are stooges, they are extras in the cast. I cannot rule out that they will withdraw their candidacies five days ahead of the election to legalize Vladimir Putin’s victory in the first round,” Zhirinovsky announced at Thursday’s media conference at the Interfax news agency. The leader of the Liberal Democratic Party added that he himself would never withdraw from the election and will never support any of his opponents, such as the Communist leader Gennady Zyuganov. At the same time Zhirinovsky said he himself is ready to accept Zyuganov’s support if the Communist leader withdraws from the election, or if Zhirinovsky himself and Putin compete in a runoff. 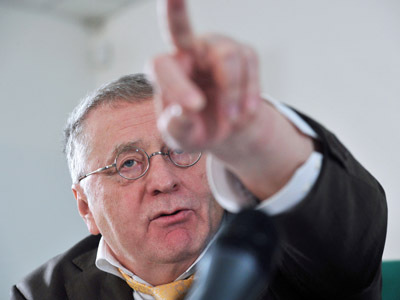 “If I make it to the second round, then naturally we negotiate, and I will come to terms with all those who want to support me,” Zhirinovsky said, stressing that he was talking only about the final stage of the poll. There are five registered candidates for the March 4 presidential ballot – four of them represent leading political parties and one, Mikhail Prokhorov, is running as an independent candidate after being expelled from his Right Cause party last September.